Entering into season 8 after accepting that this was a different show was a strange feeling; while I felt detached and able to dismiss poor plot points or infuriatingly poor character arcs the sounds of the show, the colours and some of the stories felt like coming home. Season 8 starts with Dean and Castiel stuck in purgatory where they were sent at the end of season 7 after vanquishing the Leviathan. Sam has been trying to live a normal life and had moved in with a woman called Amelia. There's a tonal shift in the beginning of the season that makes it less antagonistic than previous seasons have been recently. Dean, having escaped purgatory with a vampire called Benny whom he forged an alliance with, is inward looking and has a quiet grief over not being able to get Castiel out. Sam too is experiencing the loss of his life with Amelia. There is a period of reflection that underpins the beginning of the season as we piece together what happened in both of their lives through flashbacks. I am not sure that the continuous flashbacks were the best idea. While they added fluidity to the episodes they were also jarring when interspersed with humour based episodes or very dark episodes. Traditionally, Supernatural has walked the very fine line on humour very well. Some of this talent has been lost in more recent seasons but season 8's attempt to straddle self-reflection and grief while having humour-based episodes is definitely a low point. Castiel appears to the Winchesters, having somehow escaped purgatory. 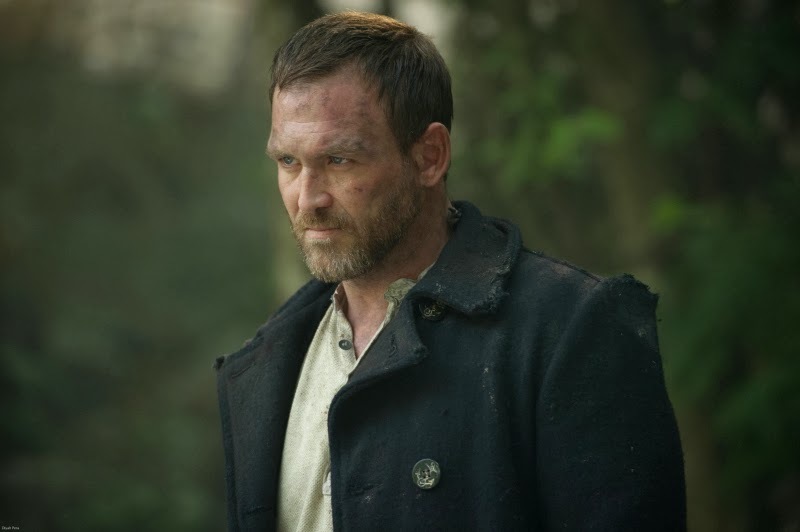 The audience are informed that a group of angels rescued him and, led by one called Naomi (Amanda Tapping), are monitoring his progress with the Winchesters. To what end is unknown. Kevin the prophet is introduced/expanded on and the word of God - a series of tablets on various topics - become one of the focal points of the season. Kevin as prophet is the only one who can read a tablet entitled 'Demons' that can allegedly close the gates to hell permanently. Predictably Crowley, the King of Hell, wants this tablet deciphered so that he can thwart any attempt made on the Hell Gate. 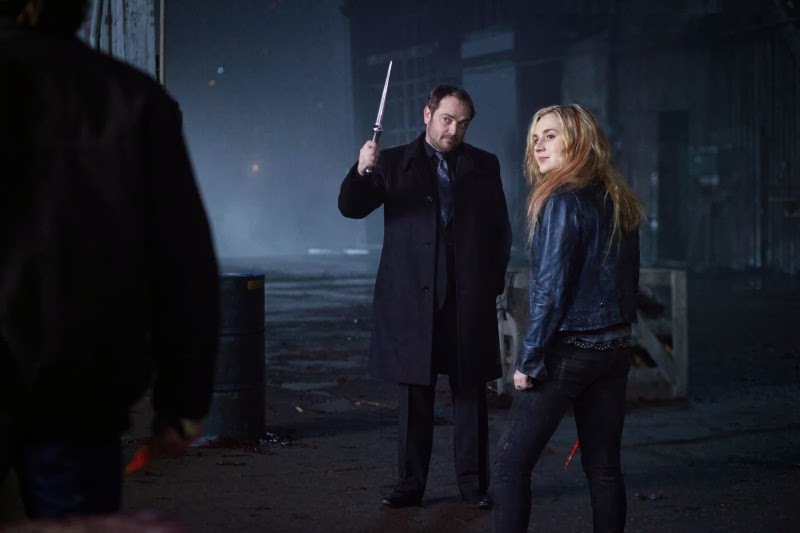 I have to say, Mark Sheppard's Crowley is one of the shows stronger points. When Crowley was introduced he was the demon that held the contracts over peoples souls, the progression he has made as a character is not only remarkable but has flowed in a more organic fashion than that of a character like Castiel. Castiel for the first half of the season is completely ephemeral. Although he is a well-loved character it seems like the last few seasons have basically been written in an attempt to accommodate keeping him - his decent to the dark side and quest to become God are the pits of these developments, but in this season he has become little more than jarring comic relief. Jokes that previously made him endearing are now like nails running down a chalkboard. It's a sad development. The first half of the season also sees Sam and Dean emotionally disconnected from one another. Although this approach has become tired over time, in this instance it leads to some interesting developments rather than superfluous angst. Sam's reflection on wanting a normal life is now a quiet determination rather than a raging need. He grows through his experiences and reflections and his disconnection from Dean helps this development. Dean becomes closer to both Castiel and Benny, which is again, critical to his personal development. Although co-dependency is still something that Dean gravitates to, this is now spread out a little more and has less of a tendency to lead to self-destruction. In particular his relationship with Benny is interesting and has led to his complete change of outlook about things he traditionally killed without question. Episode 10 of the season offers us the first opportunity in a long time to see Sam and Dean's relationship as a realistic and complex relationship. After using Amelia to keep Sam away from Benny, Sam asks Dean if he ever thought about what it would do to Sam - making him think that the woman he loved had suffered the same fate as his mother and Jessica. Dean responds by admitting that he didn't think that through and that it was a horrible thing to do, but also that Sam hadn't really heard him or trusted him when it came to Benny. Sam points out that Dean wasn't asking Sam to trust him, he was asking Sam to trust Benny and Sam couldn't do that. For the first time in a long time the conversation isn't shouty and violent; it's full of complex emotion and pain. Dean eventually walks away and there is some tension for the episode, but rather than this being prolonged for episodes or seasons on end the brothers have another honest conversation at the end of the episode. Dean admits that he's a little jealous of Sam - that Sam could actually quit the job and let go in a way that Dean has never been able to. This wasn't a barb, it was an honest comment of self reflection and admiration. He encourages Sam to make a choice and it isn't an ultimatum or a veiled test; it's a real choice and it's Sam's, but his brotherly advice is to do whatever he decides with both feet in; to commit. The honesty is refreshing and more in line with a true friendship. Sam takes a walk to think it all through and usually Dean is quite happy to give advice rather than take it. Surprisingly, he calls Benny and tells him that he can't get involved or be there for him anymore even though he wants to. It’s the end of the line for them. His friend is in a really bad way and it's a hard thing for him to do but his relationship with Benny is heading down the road that his relationship with Sam had previously and as much as Sam needed to make a choice - so did Dean. Sam also makes the choice to stay with Dean; unbeknownst to him Amelia had chosen Sam in the same way that Benny didn't want to give Dean up. Both brothers have made their choices; they were difficult, real and painful. Unfortunately, this season intersperses beautiful moments of emotional growth and sensitivity with brash humour and bad writing. The next three episodes have some of the worst dialogue, humour and plot development one could ever expect of a show of this calibre. In addition, many of the things that happen make no sense within the context of the show, the situations that the characters find themselves in or the character development thus far. Castiel disappears at Naomi’s directive and we discover that he has been experimented on and tampered with. We also find out that there is a tablet on Angels, which Crowley is now very keen to get his hands on. This is probably the best of the revelations over this time. Intermingled we see Charlie again in a strange LARPING episode and we meet Sam and Dean’s grandfather on their fathers side. Turns out he is a ‘Man of Letters’, a group of people trained in knowledge about the supernatural. He jumps forward in time to save a key to their repository of a lot of wisdom; considered a great weapon when tackling the forces of evil. Thus, we understand why John’s father wasn’t around and why he thought he had been abandoned. Unfortunately this does nothing for the internal logic of the show. Clearly, there has to be an explanation for everything now. What started off as a man becoming a hunter and training his children in the ways of hunting due to revenge grew to include the idea that it was his wife that knew about the supernatural all along. This was fine. Great even. It then made sense as to why Mary Winchester was targeted and how the Yellow Eyed Demon had come to be involved. It got silly when then all their long lost Campbell cousins came back, and their dead grandfather on their mother’s side; but now this? Their grandfather on their father’s side was part of a secret organisation as well, John was always going to become part of the fold, the angels were all gearing for that too – kind of takes away from how realistic the story is and the element of free will that Sam and Dean have always been about. They were already the chosen bloodline for vessels for Lucifer and Michael – this goes way too far. 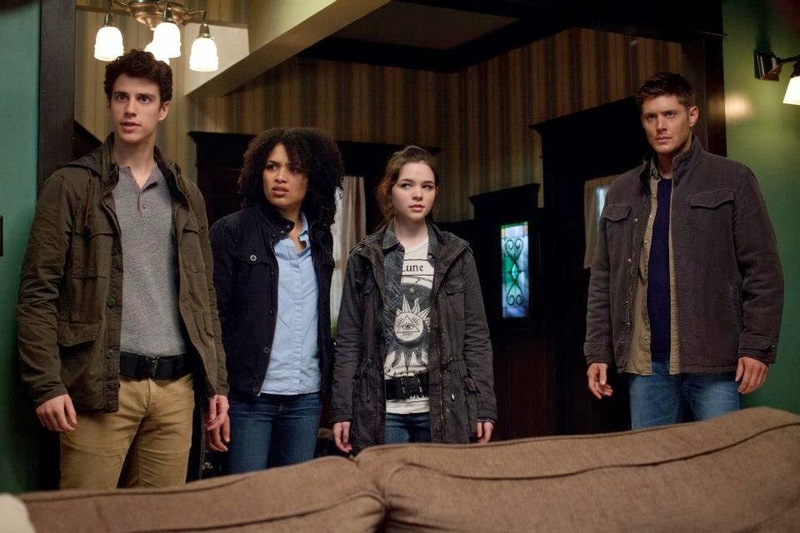 Episode 14 however, is one of the best Supernatural episodes I have seen in the last few years. 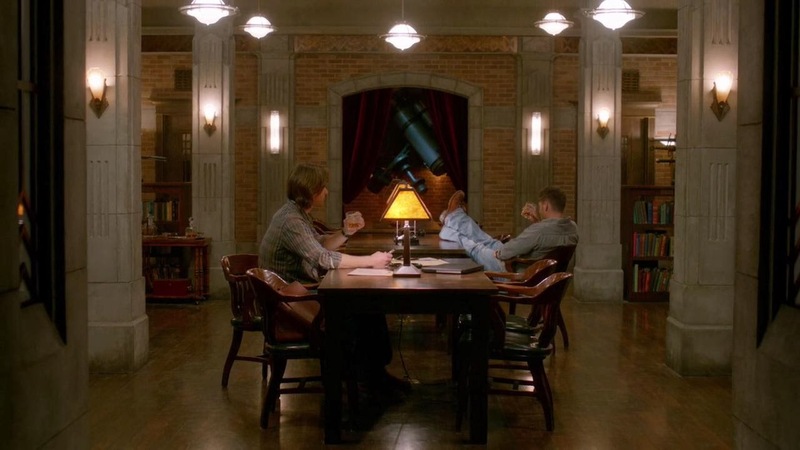 Sam and Dean us the key to the repository of knowledge and begin to make a home for the first time in their lives. Dean has a room; he sets it up and puts his picture of him and his mother on his bedside table. Turns out he can cook real food too and it’s good. Sam has all of the books he can imagine and can do all of the investigative research that he loves while they wait for Kevin to crack the Demon tablet. Turns out that Kevin isn’t doing so well; he’s burning the candle at both ends. He discovers that the way to closing the Hell Gate involves three tests constructed by God himself. The first is to kill a hellhound and bathe in its blood. Dean tells Sam truthfully for the first time that he has never ever thought he could get out of the life, and that he is really glad that Sam has. He wants to do the tests and die with a gun in his hand, and all he wants is to know that his brother has gotten out and started living his life. Of course, things don’t go according to plan and Sam is the one who completes the first test. He says that it is better because he doesn’t believe he will die shutting the Hell Gate and he wants them both to find a way out. Over the next few episodes though, we discover Sam is coughing blood and potentially dying from having completed the first test. We get to see a little more this season of the other supernatural communities that were such a part of the earlier seasons. Witches come back and so do other God’s. Something interesting about Supernatural in the past has been the elements similar to Neil Gaiman’s American Gods that deal with the different religions and faiths transported to America and what they were replaced with. It seems relevant and realistic then that Christian mythos has been a really big part of the show moving forward, but delving into the older religions has always been a strength. This seasons detour into that world was Prometheus, Artimus and Zeus and although it was a little rough around the edges it is certainly an area that the show should extend to again in the future. Castiel returns having been reprogrammed by Naomi; conditioned to kill Dean over and over again so that when the need arose he could do it without any hesitation. He returns to the brothers and initially lies to them about the Angel tablet at Naomi’s instruction. Things get complicated however, when Meg (the demon) shows up. She’s been held hostage and tortured by Crowley for the last year and knows of one of Lucifer’s crypts where the tablet is probably hidden. Why the tablet is in one of Lucifer’s crypts is beyond me, not to mention why we haven’t heard about this before and this seems to be a fleeting episodic development. We discover that Meg and Castiel actually had a fling when she was caring for him in season 7 and it seems like they still have feelings for each other. Meg listens to Sam’s story about Amelia and refers to her as Sam’s unicorn – his love and hope. She later calls Castiel her unicorn. Upon Dean’s retrieval of the tablet, Naomi gives Castiel an order to kill him and he very nearly does. When Dean tells Castiel that he is family and that he needs Castiel, he manages to break Naomi’s influence and stop himself. Castiel then leaves with the tablet to protect it from both Naomi and Dean. Meg defends Sam and Dean while they get away and is killed by Crowley in the process. Okay, let’s talk about Meg for a second. For those who can’t remember who she is, Meg originally appeared in season one of the show and was badass and scary. She is the daughter of the Yellow Eyed Demon so a pretty big deal. Seasons later (maybe season 5) she returned in another body – not nearly as well characterised as before. For some reason she then sided with the Winchesters over time and is slightly good now as a result. Why couldn’t this just have been another demon? Why did it have to be Meg? Everything would be more or less fine if it wasn’t the same demon. The humour doesn’t really work, the actress isn’t really playing Meg – she’s playing a different demon and that would be fine if she wasn’t supposed to be Meg. I did love her scene with Castiel though and I thought they had some real chemistry. Unfortunately, as with most of the female characters on this show, the second she got interesting she got dead. Meg points out that despite everything they never looked for her in over a year. The writers of the show basically brought her back to kill her. Great. We get to see more of Naomi in this episode and although Amanda Tapping is fantastic in what little we see, she is massively underutilised. Her relationship and control over Castiel never really develops or truly seems like it’s any threat whatsoever. Now with Castiel gone we see a brief interaction between Naomi and Crowley where there is an inference that she and Crowley has history. The acting sparks were all over that scene so one can hope that from this point on Crowley and Naomi will get some more scenes together and we’ll get some better character development. The episode ends with a lot of strong statements about family and the relationships between Sam, Dean and Castiel. It is Dean’s proclamation of kinship that stops Castiel from succumbing to Naomi’s mind control. Dean also tells Sam that he knows that Sam is sick, and Castiel confirms that it’s something that not even his angelic powers can heal. Sam agrees not to lie or hide anything from Dean moving forward which one can only hope is followed through on. That family theme continues strongly in the back end of the season. 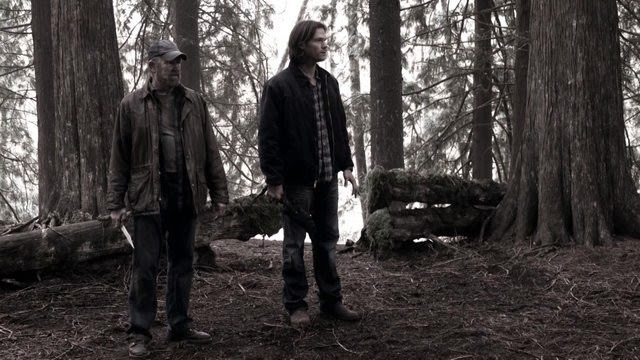 Sam and Dean come upon Crissy again, whose father has now been murdered, and an interesting concept presents itself about the future of hunting and teenage hunters. If anything ever screamed spin-off in this show, it was probably that episode. With a little brush up on the acting I think that would be considered an interesting pilot to say the least. 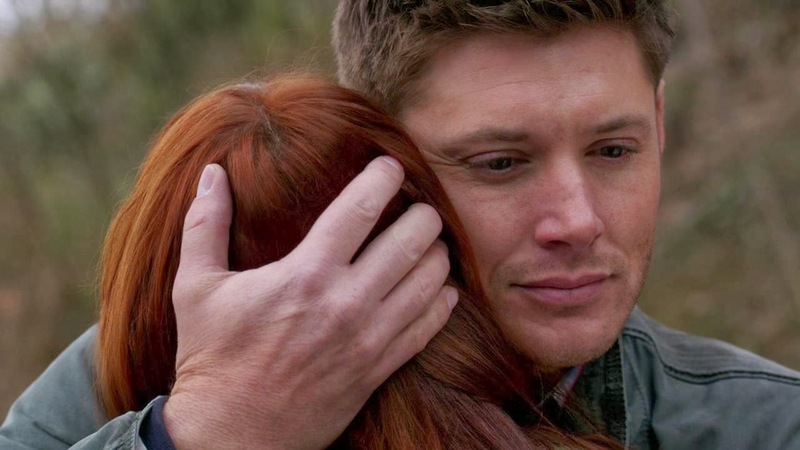 Dean becomes a paternal figure to Crissy in the episode (maybe an extension of the older brother) but this affection and responsibility passes on to Benny, Charlie and Kevin in the following episodes. Dean ramps up his affection for Sam (and for Castiel), and it seems that this paternal instinct will be integral to his future development. For his second trial, Sam has to rescue an innocent soul from hell and return it to heaven. Conveniently, the brothers discover that Crowley sent Bobby to hell and therefore they intend to rescue him. It follows the family concept beautifully but is a bit underwhelming and rushed to be honest. The idea of rogue reapers who know the back doors into heaven and hell is a really interesting idea, and yet we never get a chance to explore it in an episode that is fixated on exposition and getting to the end post. Sam has to go through purgatory to get to hell and Dean freaks out when he discovers this; yet Sam’s time in purgatory does not seem at all similar to Dean’s time there (baring the washed out colour technique used to convey to the viewer that they are indeed in purgatory). Similarly, Sam’s trip into the dungeons of hell could have allowed him to revisit some pretty intense feelings which did not happen and allow us to become deeply afraid of hell which also didn’t really float. Sam finds Bobby far too quickly and unbelievably convinces him that he is real. Bobby then chastises Sam for the choices that he and Dean have made since Bobby died; it’s lacklustre to say the least. The interesting part is that Dean contacts Benny again and asks him to go back to purgatory and get Sam out by showing him the portal. Benny has been having trouble adjusting to the world again and figures that staying in purgatory is what he is meant for. It’s a poor ending to an otherwise interesting season long arc. 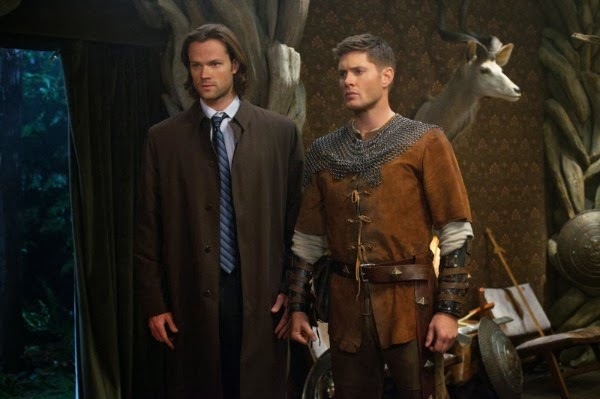 As Sam gets sicker, he and Dean stumble upon Charlie again and the little sister story arc continues. There are some tender moments and there is an interesting bit of character development for Charlie in the mix about her parents and how they died, but again the execution doesn’t quite work. Charlie hasn’t really spent enough time with Sam and Dean to say she loves Dean, or even to feel the way she does. While the declaration is welcome, it is premature – especially given that Dean’s response ‘I know’, while intended to be tender and reciprocated, just serves to further ingrain the shows hang up about its characters displaying real affection and emotion for females and minority groups. Kevin manages to outwit Crowley and Mark Sheppard delivers some of the best scenes of the season in his humorous banter with the demons pretending to be Sam and Dean in the charade he has set up to try to control Kevin. 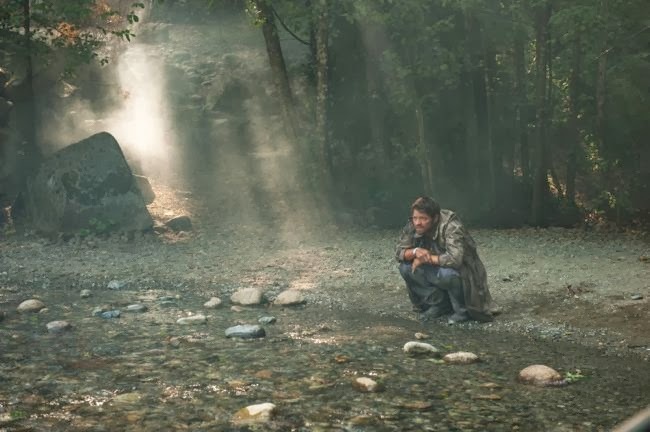 Sam and Dean find Metatron who has been in hiding and completely disconnected from everything that has been happening in the world. He explains the history of God and the Archangels. Sam and Dean convince him to help them and he rescues Kevin at a pivotal moment, injuring Crowley, which is no mean feat, and allowing Kevin to retrieve the other half of the demon tablet. 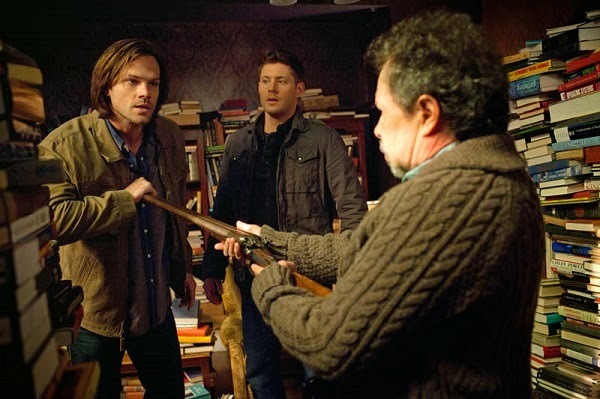 Metatron warns Dean that what they all do next is the point; that free will is exactly that and that they must weight up the potential costs against the potential outcomes. 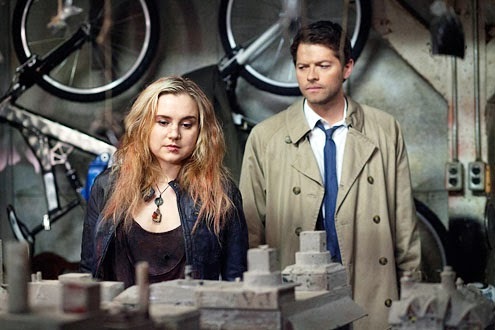 Naomi and her cronies finally locate Castiel. She tells him that she has reset him countless times and this opens up a whole new level to the mythology of angels in this show. Turns out Crowley has an angel on the pay roll and gets to Castiel; figuring out that Castiel has stashed the angel tablet inside of him. Once free, Sam and Dean encounter Castiel injured on the road out of town to try to complete the final trial; purifying/saving a demon. In the quest for purifying a demon, Sam and Dean conveniently stumble on some experimental work being performed by a priest and documented by the Men of Letters. It’s an annoying plot device but it’s there. The real corker is that Crowley has worked out that although he does not know what the trials themselves are, he can stop the brothers from participating if he systematically starts killing off all of the people they have saved. It’s a genius idea really. Take the reason that Sam and Dean can justify their lives and everything they do and burn that all to the ground. Unfortunately it means that season one favourite Sarah comes back only to be killed off. What is with this show and killing all of the women right when they might have agency and personhood? Sarah was a fantastic character with gusto and sensitivity. She and Sam helped each other and if the show were smarter it would have revisited her a long time ago. In this instance it literally brought her back to kill her off. It’s a trend though, as evidenced earlier in this review with Meg. Separately, one episode from the end of the season, Castiel is told by Metatron that he can shut the gates to heaven and that this would be good for all concerned. The first trial is to rip the heart out of the child of a human and angel. As only one exists in the world, and she has been nice to Castiel, it makes sense that the show then demonises her to legitimise Castiel taking her life. Whatever show, whatever. Of course, the season finale indicates that we’ve been pointed in the wrong direction all along. Naomi captures Metatron and drills into his mind, discovering that he isn’t interested in the salvation of heaven at all, but was using Castiel to perform a spell that will force all of the angels to fall from heaven and walk the Earth as humans. This way Metatron believes that he will have his revenge and the stories that he craves when these souls return to heaven. He kills Naomi just as we begin to question whether or not she is actually trustworthy. Before she is killed, she tells Dean that if Sam completes the trials he will die. 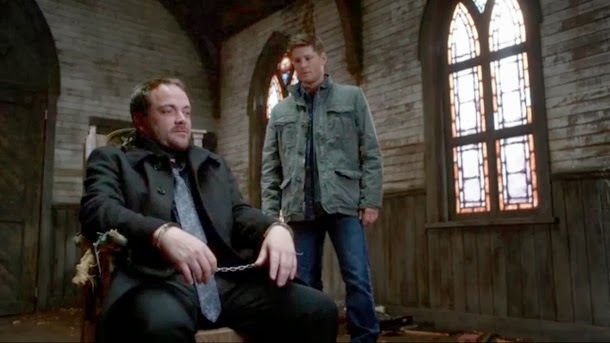 The brothers have captured Crowley and are using him for the final trial. Sam has been injecting him with his purified blood; having confessed his sins. We watch Mark Sheppard deliver a stunning performance as Crowley shifts into a mortal with a conscience. 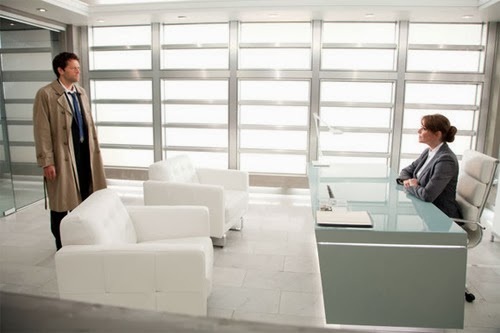 As Sam is about to complete the trial and permanently cure Crowley, Dean enters and tells him the stakes. Depressingly, Sam asks why sacrificing himself would matter at all. The brother’s share a heartfelt moment when Sam tells Dean that the sin he confessed to, above all other things, was letting his brother down. He tells Dean that it hurt too much watching Dean pick other people over him; Benny, Castiel – which is great because that really needed to be addressed. Dean emotionally assures Sam that there isn’t anything, past or present that he could ever truly believe was more important and that it has never been any other way and that he is sorry Sam felt that way. 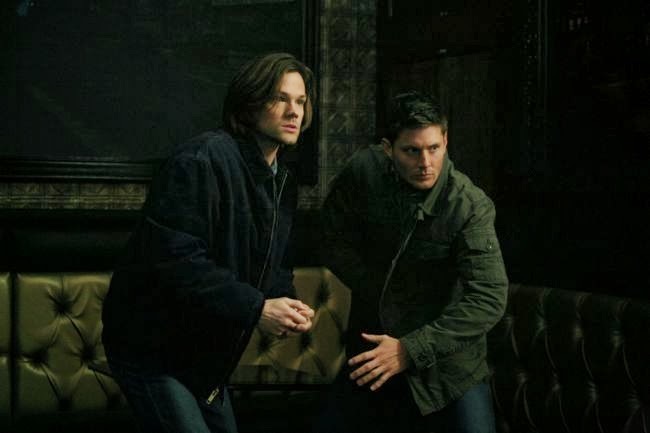 He convinces Sam to stop and the pair rush outside in response to some loud noises. We see that Castiel has fallen and cannot hear nor respond to Dean’s calls for help. Sam has deteriorated despite not following through with the trials. At the Men of Letters Bunker, Kevin watches all the sirens go off and all of the dormant equipment start coming on-line. 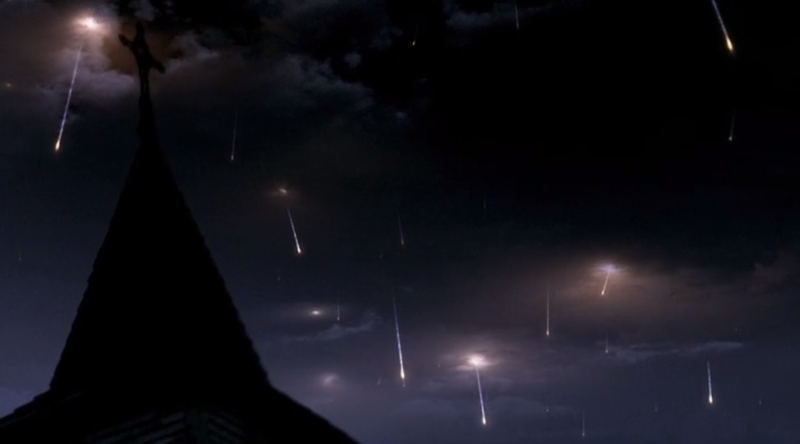 Dean looks up and all of the angels are falling, like meteorites, from the sky. It’s a great ending, leaving many of the lead characters in new roles with new challenges and all facing some pretty imminent peril. We have a new villain set up for the next season and new stories to tell; especially in relation to Castiel who will have to learn to live a normal human life. Will Crowley be totally saved and have to do the same? Will Sam survive or will he die and perhaps become an angel? What will Metatron do and will the gates to hell actually be shut? The only stupid thing about the season 8 finale was the use of Abaddon. Abaddon is a female demon known as a Knight of Hell. She shows us when the boys meet their grandfather and learn about the Men of Letters. She’s great for that episode but perhaps pointlessly; they bring her back in the last two episodes of the season to do basically, nothing. It’s disappointing because it makes the Knight’s of Hell, something that could be really interesting in the lore of the show, seem like they can’t organise their way out of a paper bag and aren’t nearly as menacing as they are described to be. It’s possible that because the season finale was so male heavy that the writers wrote her in to add one token female. Season 8 is leagues better than seasons 6 and 7 and offers some genuine character development, emotional moments and interesting plot points. I can’t say that the writing is as consistent or smooth as in the earlier seasons and the pacing often suffers as a result. Overall, it’s not the kind of show I think I can be heart and soul invested in again but it’s definitely comforting to watch unfold while chilling out and not overly engaging; especially if you, like me, get the feeling of home when you watch it. Its terrible episodes must be forgiven, lest the rage begin again, but also can be skipped if you have a good rec source. All up, make sure you remember that these aren’t the brothers you once loved and you just might be surprised and grateful when glimpses of the ones you loved shine through.